arrow_forward How do I manage my profile settings? 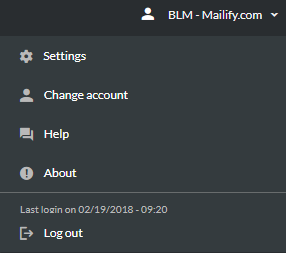 arrow_forward How do I manage my account settings? arrow_forward How do I manage my email campaign settings? arrow_forward How can I manage the settings for my SMS campaigns? arrow_forward How can I manage the statistic settings? arrow_forward How do I manage my dedicated domain names? arrow_forward How can I manage the Mailify Sunrise connectors? arrow_forward What is the purpose of the developer's configuration? In your profile settings, you can add and edit your user information. 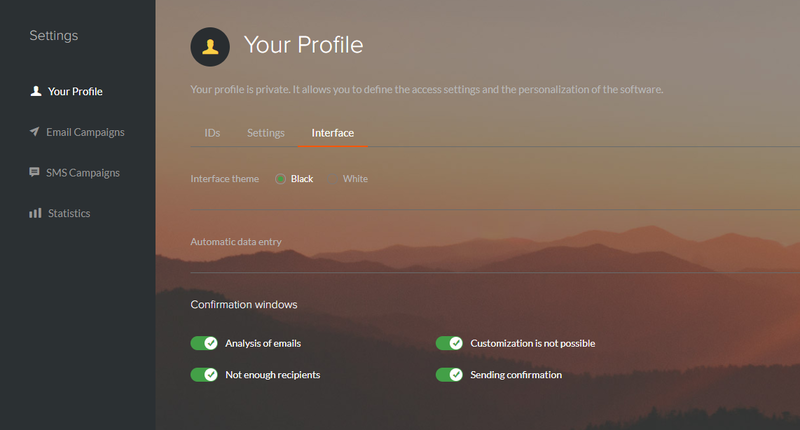 This profile is personal, it allows to define your login details as well as customize certain aspects the software. To access your profile details, simply click on the drop-down menu and select "Settings". In your profile details you’ll find the information you provided when creating your Mailify account, such as: title, surname, first name, profession, and your login details. Here, you can update your login email address and your password if your need to. If you change your email address, an email will be sent automatically to activate this new address. All you have to do is click on the link in this email. For each modification you’ll need to confirm the requested change. Mailify Sunrise allows you to analyze the email addresses of your contact lists, to identify duplicates and/or incorrect email addresses. Where possible, Mailify will automatically suggest a correction. When importing contacts, the software will automatically propose to analyze the contacts through a pop-up window. This notification can be deactivated. This window appears when defining versions A and B for an A/B test in your campaign. It informs you that the number of recipients is insufficient to perform an A/B test. To gain enough views across all your recipients for a relevant result, it’s important to respect a minimum number of contacts to perform your tests. If the number of recipients is too low, your test results may be inconclusive or inaccurate. This notification can be deactivated. This warning can appear when sending a test or a final batch. It informs you that the database is missing some data needed to personalize your message for certain recipients. This notification can be deactivated. Before you send your campaign, a confirmation window appears after choosing the date (send immediately, or schedule a date). This confirms that you indeed want to send your campaign to your database. This notification can be disabled. How do I manage my profile settings? How do I manage my account settings? How do I manage my email campaign settings? How can I manage the settings for my SMS campaigns? How can I manage the statistic settings? How do I manage my dedicated domain names? How can I manage the Mailify Sunrise connectors? What is the purpose of the developer's configuration?